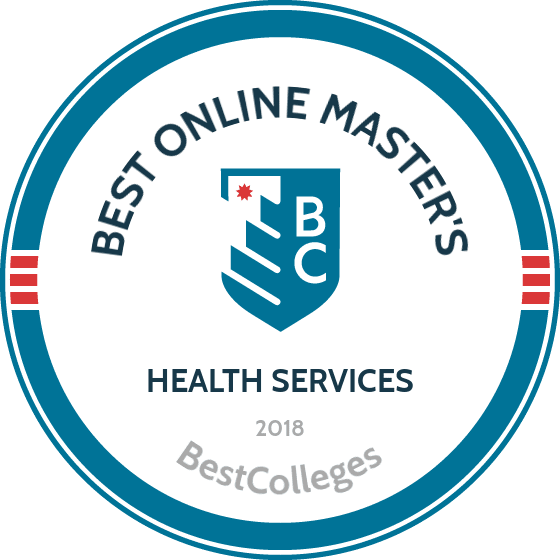 What are the Best Online Master's in Health Services Programs? What Else Can I Expect From an Online Master's in Health Services Program? A health services administration online master's degree prepares learners for work in a variety of healthcare and medical settings, from research facilities and nonprofit community health organizations to government agencies and hospitals. Health services professionals possess management, information technology, and financial skills as well as in-depth knowledge of health practices and insurance policies, ensuring that their teams function effectively and provide patients with proper care. The health services field in the U.S. continues to expand rapidly due to federal government mandates and the needs of an aging baby boomer population. By enrolling in a master's in health services administration online program, students gain the training needed to occupy a variety of positions, including program coordinators, healthcare database administrators, policy specialists, and health services managers. In fact, the U.S. Bureau of Labor Statistics (BLS) projects jobs related to medical and health services management to grow by a remarkable 20% through 2026. This guide provides a wealth of information to help prospective students find the health services program that best fits their academic and career goals. At the University of Central Florida, students have the option to complete dozens of undergraduate or graduate degrees online. In the fully online master of science in executive health services administration program, students prepare for careers as healthcare managers. Graduates go on to work as administrators, chief nursing officers, and practice managers. In the synchronous 120-credit curriculum, UCF's master's in health services administration online programs use a cohort model that caps at 30 students and ensures all students receive individualized attention from professors. The cohort model encourages student networking, which can lead to employment opportunities after graduation. Throughout the program, the College of Graduate Studies provides students one-on-one support to help them stay on track for graduation. All applicants must have three years of health management experience prior to admission. The program also requires applicants to submit GRE scores when applying. Once accepted, all students pay the same credit-based tuition no matter their state of residency. Central Florida grants certain fee waivers to online students. Florida International University understands that, as the population ages, healthcare managers require a new set of skills to provide care. In the master of health services administration program, professors apply the latest research to gerontological best practices. Participating students can earn their degrees in two years. The 48-credit hybrid curriculum stresses foundational courses and integrative coursework. Courses unique to the Florida International curriculum include financial management of health systems and HMO and Ambulatory Care Administration. At the end of the program, students complete a master's research project or an administrative residency practicum experience. All applicants should submit a professional writing sample in addition to undergraduate transcripts that reflect a minimum 3.0 GPA. Florida International does not require standardized test scores when applying to its health services administration online master's degree. Once accepted, students may begin classes in the fall or spring semesters. Florida residents save approximately 33% on tuition compared to non-resident students. For future healthcare administrators living in Detroit, Michigan, or the surrounding area, the University of Detroit Mercy offers a hybrid program that appeals to both full and part-time students. In the master of health services administration program, students take evening courses on campus in addition to online coursework. Full-time students can earn their degrees in just over two years. Course highlights in the 47-credit master's in health services administration program include strategic planning, information systems, and financial management. Students complete a capstone experience during the program's midway and end points. Also, students have the option to complete one of two certification programs. Mercy requires all applicants to have earned a minimum 3.0 undergraduate GPA; applicants whose GPAs fall below this requirement may receive conditional admission. The university encourages applicants to have work experience in the healthcare field. Once accepted, students may begin the program in the fall, winter, or summer semesters. All students pay the same credit-based tuition. Every year, more and more Americans require gerontological services. To meet the demand for skilled healthcare administrators in this field, the University of North Texas created the fully online master of science in health services administration program. The 36-hour curriculum stresses the knowledge and skills students require to work with the nation's rapidly aging population. All students complete the synchronous core curriculum before selecting a concentration: applied gerontology, long-term care, or rehabilitation services. These concentrations give students the ability to personalize their educational experience. All concentrations require a capstone course or internship experience near the end of the program. North Texas requires applicants to its health services administration online master's degree to have earned a minimum 3.0 undergraduate GPA. Applicants must also submit GRE scores. Once accepted, students may begin the program in the fall, spring, or summer semesters. All students pay the same tuition no matter their state of residency. At Columbus State University, students have the option to complete their degrees at the Columbus, Georgia, campus or through a hybrid model. Within the hybrid master of public administration-health services administrator track, students can complete their degrees in only two years. Graduates go on to work at health and non-profit organizations. The 36-hour curriculum stresses both core and concentration courses. Unique courses include public budgeting and microsystems in health service. At the end of the program, students choose to complete an internship or an advanced course in ethics, justice, or organizational theory. To remain in good academic standing, students should earn a B grade or higher in all courses. Students can apply to the master's in health services administration online program for the fall or spring semesters. Students may submit either MAT or GRE scores. Columbus State occasionally accepts applicants with less than a 3.0 undergraduate GPA on a conditional basis. In-state students save approximately 75% on tuition compared to out-of-state students. To maintain accreditation, colleges and universities need to meet certain curricular and professional standards. This means that many master's in health services administration online programs share similar core and capstone requirements. However, beyond these shared classes, students have the freedom to individualize a degree plan according to their interests. Marketing and strategic planning: This course teaches students about empirical techniques and analytical procedures related to effective market research. Students analyze case studies and apply skills to practical scenarios, using research data to create and implement healthcare management plans. These business skills benefit all health services professionals, particularly financial managers. Policy analysis: Students learn the processes behind selecting the right policy analysis techniques as well as best practices for planning and implementation. This class also covers the historical developments of policy analysis and how it is embedded into the structural and social workings of an organization. This course is especially beneficial to future policy advisers, auditors, and nonprofit professionals. Legal aspects of health services administration: This course covers the statute and constitutional laws related to administration procedures, including due process. Students also analyze topics relevant to private organizations and health practices, such as patient rights, contracts, taxation, surgical consent, malpractice, and liability and immunity. These topics may prove particularly helpful to healthcare lawyers and policy makers. Managing human resources: A mainstay topic for business management, this class covers techniques that improve staff efficiency and organizational performance in healthcare organizations. Topics include employee selection, training, compensation, performance appraisal, and access to professional resources. This course prepares learners to pursue work as human resources coordinators, program directors, or departmental managers. Ethical decisions in health services administration: From historical roots and political philosophy to contemporary organizational and governmental policies, this course teaches students how to make ethical decisions related to supervision, management, and clinical practices. Students also analyze the class and race dynamics that influence healthcare, as well as resultant inequalities within the U.S. system. This course is especially important for professionals in the nonprofit sector. How Long Does It Take to Get an Online Master's in Health Services? Students pursuing health services administration online master's degrees typically complete about 30 credits and take approximately two years to graduate. However, certain structural and content-related details may alter this timeframe. You can expect most online courses to be asynchronous, but some schools do feature synchronous courses as part of their distance education curricula. Some colleges and universities may also use a cohort learning style where students progress through their program as a group, taking one class at a time. This format highlights collaborative learning, but it may be less flexible and take longer to finish. Students looking to expedite their studies should look for programs that facilitate individually paced study, offer accelerated online classes, and allow for course enrollment year-round. Additionally, you may want to prioritize schools that let you fulfill internship and capstone requirements with organizations in your community, such as with your current employer. American Association of Healthcare Administrative Management (AAHAM) Certification: AAHAM offers five options for professional certification, including options for administrators involved in the revenue cycle and those tasked with processing patient accounts. Test takers can choose from specializations in either professional or institutional health services. Requirements vary based on the specific exam, and online test options exist. Certificate holders must become recertified after a designated number of years. National Association of Long Term Care Administrator Boards (NAB) State Licensure: Professionals interested in working at long-term care facilities, such as nursing homes, must obtain a license that meets the requirements of the state where they practice. This process includes passing the appropriate NAB exam. Exam requirements, including minimum professional experience and price, vary by state. To earn a valid health services administration online master's degree, you need to enroll in an accredited college or university. Two main forms of accreditation exist -- national and regional -- and many of the best schools gain and maintain both. Through subsidiary partners, the U.S. Department of Education (ED) and the Council for Higher Education Accreditation (CHEA) grant national accreditation to schools that meet defined academic and professional standards. The ED works to ensure that colleges and universities follow federal government mandates related to education; in turn, these schools receive federal funding and lobbying privileges. CHEA boasts over 3,000 member institutions and supports schools through research and outreach initiatives, policy advocacy, and financial incentives. The council also enforces academic and professional standards among its cohort. Visit the ED's and CHEA's websites for more information about nationally accredited master's in health services administration online programs. Six organizations, also recognized by the ED and CHEA, bestow regional accreditation depending on where a college or university is located. Like the national entities, these organizations ensure schools standardize certain institutional, curricular, and student outcomes. Practically speaking, employers prioritize regional accreditation because they interact with local and state authorities more often. Additionally, master's in health services administration online programs can also receive specialized accreditation through field-specific organizations like the Commission on Accreditation of Healthcare Management Education. The table below contains popular careers held by individuals who earned a health services administration online master's degree, with specific attention paid to changes in salary over a worker's career. As with most careers, work experience -- which reflects skills developed and relationships cultivated on the job -- strongly dictates how much a health services worker gets paid. However, the field also prioritizes industry-specific skill development through training programs and other forms of practical education. Some professions even require official certification and/or licensure. Individuals who graduate from a master's in health services administration online program learn the IT, business management, and financial tools needed to succeed in some of the fastest-growing careers in the U.S. Although graduates can pursue behind-the-scenes positions as information analysts or health systems technicians, the highest-paying jobs necessitate the use of sound communication and ethical leadership skills as part of a team. Health services managers must also stay on the forefront of technological and policy changes in the field. These professionals plan, direct, and analyze the administrative functions of an organization, ensuring growth and profitability. This includes meeting with executives to develop and implement strategic plans. HR managers also oversee the recruitment, training, and assessment of new staff. Due to their advanced position, these workers typically hold at least a master's degree and possess substantial work experience. These expert administrators set information technology goals for an organization and lead their teams to meet those goals. Responsibilities include overseeing daily IT functions, such as installation, maintenance, upgrade, and overall cost analysis. Computer and information system managers usually possess a professional certificate or license in addition to a graduate degree. Health information technicians manage records and data for organizations, ensuring that information is accurately categorized, coded, organized, and accessible to the right individuals and parties. To become a health information technician, individuals must hold a bachelor's degree and receive additional training. Professionals with graduate-level credentials tend to enjoy higher pay. These professionals usually work for nonprofit social services and community organizations. They oversee daily operations and develop strategic plans similar to those found in businesses. Community service managers also meet with stakeholders and lead their teams to meet specified goals. This position usually requires a master's degree, but some positions only require a bachelor's degree. Also known as healthcare executives or administrators, professionals in this role plan and manage the operations of healthcare and related organizations. This includes entire hospitals and research facilities or a specific department or clinical area. In addition to having the same education and experience requirements as other managers, healthcare executives must also understand and be able to adapt to changes in healthcare regulations and laws. While a health services administration online master's degree provides you with the tools and knowledge needed to succeed in your chosen career, you should also consider joining a professional organization. Members usually pay an annual fee and gain access to institutional support that bolsters job prospects and advancement opportunities. Resources include academic and research funding, leadership and skill training programs, and networking opportunities through conferences and social events. Founded in 1968, AAHAM is the premier professional organization in the health services field. Members get access to local chapters, discounts on services and products, a job bank, and the opportunity to participate in the association's Annual National Institute. ACHE is an international organization consisting of over 40,000 individuals. Members enjoy access to certification programs and career resources like self-promotion support and a job center. The college also supports education and research through funding and advocacy. With over 38,000 members, HFMA is the leading professional body for healthcare finance leaders. Members receive career placement support, research opportunities, and education and skill training through webinars and conferences. Dedicated to improving customer access services in healthcare, NAHAM provides certification, networking, and educational opportunities. Members also gain access to a career center, conference and research opportunities, and financial awards. AHIMA focuses on improving standard care practices in the U.S. The association provides access to online training programs, conferences and virtual meetings, and student awards and volunteer opportunities. As you look into prospective health services administration online master's degree programs, it is important to consider a school's cost and financial aid options, as well as how an institution can help enable your career goals. To minimize student loan debt, which grew by 75% between 2004 and 2014 according to the Center for Financial Inclusion, students should fill out the Free Application for Federal Student Aid (FAFSA) form to apply for multiple grants and loans simultaneously. Prospective learners should also seek out opportunities offered through community and professional organizations, such as the Gates Millennium Scholarship and awards facilitated by the Indian Health Service.